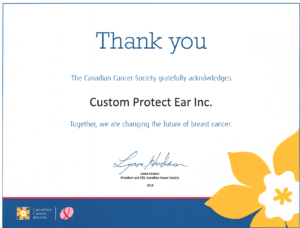 Custom Protect Ear donates $40,540.00 the Canadian Cancer Society. The total of $40,540 of represents the monies collected and matched since 2010, for the Pink dB Blocker Initiative. 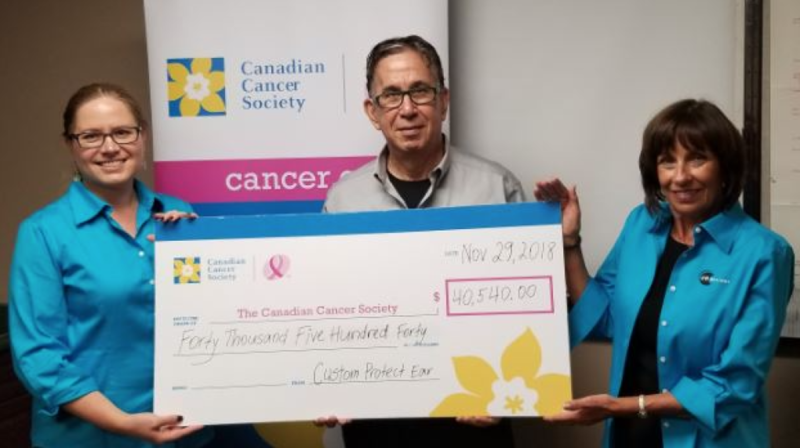 All proceeds are provided to the Canadian Cancer Society. Your support of our products allows CPE to donate a portion of what we make to charity each year, and facilitate ways in which to raise additional money for causes that touch our stakeholders personally. One of the ways we contribute is through the Pink Blocker Initiative. Cause-related initiatives are an important part of the CPE corporate culture, and we welcome your ideas for helping us expand our programs in cancer research, autism support, education for better hearing health, and more eco-friendly ways of doing business. “We wish to thank all those who have so willingly donated to the cause to help find the cure”.